The Niagara Migrant Workers Interest Group works collaboratively with local organizations to coordinate essential services for Migrant Workers in our region. The Niagara Migrant Workers Interest Group (NMWIG) was formed on July 12, 2010 by representatives of not-for-profit community organizations in Niagara. Our primary objective is to work collaboratively to address the needs of agricultural migrant workers in our Region. Seasonal migrant workers, who come to Canada each season via the Seasonal Agricultural Workers Program (SAWP), are the backbone of the agricultural fruit and vegetable industry in Canada, and in Niagara in particular. Migrant Workers face multiple challenges and obstacles in accessing services and information crucial to their well-being during their stay in Canada. Services that they are entitled to, such as health care, are often out of reach due to these barriers. Information is often presented in a language workers do not speak, and social isolation is common. As a result, many migrant workers are are left with few resources to help them deal with the health, social, and legal issues they encounter while in Canada. 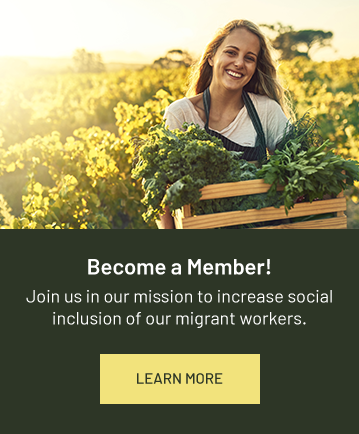 NMWIG member organizations work together to address three main areas of concern for agricultural migrant workers, which have been identified in academic and research papers and by agricultural migrant workers themselves. To meet guest workers' needs in Niagara, NMWIG coordinates the efforts of individuals and interested organizations that provide services in advocacy, health, transportation, nutrition, finances, employment, worker's health and safety, and language and education for seasonal migrant workers.